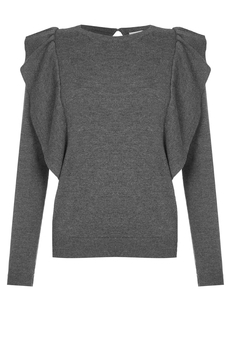 Yumi London Frill sweater in butter-soft lightweight knit, features on-trend ruffles along the front sides and the back, round neckline and teardrop cut with button at the back. Is approx. 60cm in length and it simply slips on. Winter collection. Composition: 9% Wool, 46% Polyester, 22% Polyamide, 23% Acrylic. Color: Dark grey.